Book your dream holiday trip Hong Kong and Macau Package tour package with Sarthak Tours and Travels to world’s best tourist destinations. Hong Kong and Macau both has more interesting sights and sounds to enjoy to the core. Hong Kong is the land of rich culture and Macau is popular for its natural sceneries. Hong Kong is the dazzling city with lot of harbors and it is the global financial hub. It is the city with mixed culture and living. The city tour offers you the magnificent view of the whole city. Macau also well-known as Las Vegas of Asia has several options to experience the nightlife and this will be the right option for couples and friends to have fun during their vacation. What can one expect in Hong Kong, Macau tour? Tour to Hong Kong will offers the tourists a mixture of adventure, stunning vistas, delightful experience, and colorful sights. Families can expect many lively attractions in Hong Kong with lot of shopping options, city tour to attention-grabbing sights, etc. Macau is popularly recognized as “Casino Capital of Asia” is well suited for one who visits different places for grabbing fun. It also has a number of iconic hotspots and destinations for finest shopping and dining. After landing to the city check in to the hotel booked for you and relax to enjoy the upcoming days and events planned. Victoria Peak is the first destination in any of the Hong Kong tour package as which gives you the panoramic view of the whole city. The mountain also called as the Mount Austin from which all the island surrounding the mountain will be clearly visible. Peak Tower and Peak Galleria is the leisure nearby the mountain. It also has the garden to spend family time peacefully. Aberdeen is the fishing village where one can still feel the complete tradition even in the clothing. This village has the ferry stop and many sampan ride stations. The sampan ride will drive you into the floating village and can sail in the house boats which have all the modern household amenities. Hong Kong Skyline is renowned for its unique arrangements with mountains and Victoria peak in the surroundings. Evening time you can see the 44 buildings glowing with the colorful lights called as “A Symphony of Light”. One complete day will be engaged by visiting above hotspots. Next day you will be busy in enjoying the exciting rides of Disneyland Tour. Then also enjoy the parade by the Disney characters for Disney songs. Some exciting parade is Disney on Parade, Disney in the stars, Mickey’s Waterworks, Glow in the Park Halloween Parade, etc. 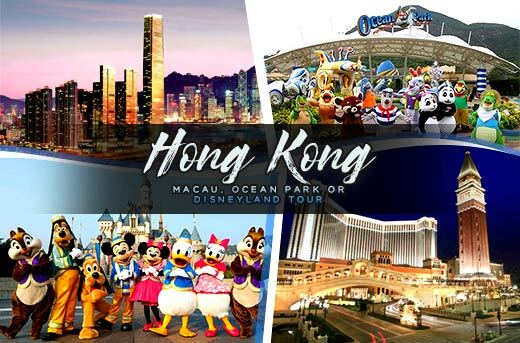 The itinerary of the Hong Kong tour must have the place to Ocean Park one of the largest two theme parks in Hong Kong. It has numerous attractions like Arctic Blast, Arctic fox den, Amazing Bird Theatre, Bouncer House, Bumper Blaster and much more things to have amusing experience. After completely enjoying in Hong Kong lets travel to Macau with the same fun filled mind. Enjoy the ferry wheel ride as you leave Hong Kong to the Macau shore. It is the city full of glamour, heritage, and much gambling. Let’s start with the visit to the time travel to 16th century- Ruins of St. Paul’s. Don’t miss this old age architecture where the walls are filled with patterns of angels, devils, sailing Portuguese ship, etc. The building resembles the old age church and has the lush green garden. It is one of the important World Heritage sites which are not only for shops and fine restaurants but it is the place which rely the miraculous history of Macau. One may have stunning experience here during festive seasons where one can watch the lion and dragon dance along with the thrilling fireworks. Don’t miss the Macau tower which shows you the beauty of Macau city. Gordon Moller has the stunning imaginary skill to build such an amazing structure. Climbing to the top of the tower is one of the adventurous activities one should try. Na Tcha Temple a Chinese folk temple which is the home for child God of War. A small and pretty temple painted in gray and some paintings draw numerous visitors of Macau. City of dreams in Cotai will glitter the beauty of the nightlife. One who dreamt for the nightlife entertainment then head to this place to lose you with casinos, pubs, sparkling discos, relishing live performances, branded designer shops, global restaurants, spas and much more exciting zones. The name of Venetian arises as all the hotels are decorated with the theme of Venice. It has lavish living features, glamorous shows, stunning exciting activities, and much more. If you are the one who wish to know the culture of history of the place you visiting then to know more about the communities of Macau this museum will helps you out. It is located in Monte Fortress which showcases all the ancient items which resemble the culture and way of living of old communities. It offers the history of Macau in Neolithic period. We at Sarthak Tours and Travels arrange all your international tour from ticket booking to your safe stay at the most affordable prices. We are here to guide you for all the travel associated services. We will give you the best quality accommodation, plans and reservation facility to places all over the world. We provide number of offers to make your dream true. If you are searching for the most trusted travel agency to look over your travel plan then call us through Phone: 91-9871319738, Landline number: +91-0120-4154760.